1. 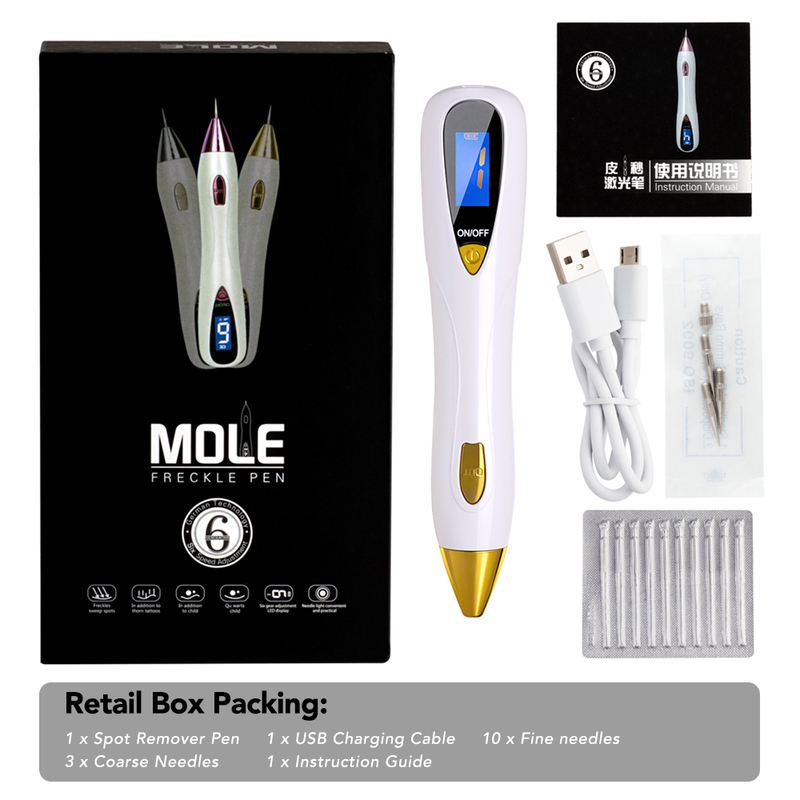 Adopting the latest electric ion carbonization high-tech, will not make people feel the presence of current, safe, effective without bleeding in the process of use. 2. 9 intensity for different treatment. Using 9 adjustable scanspot power output, treatment of smart, reliable. 3. 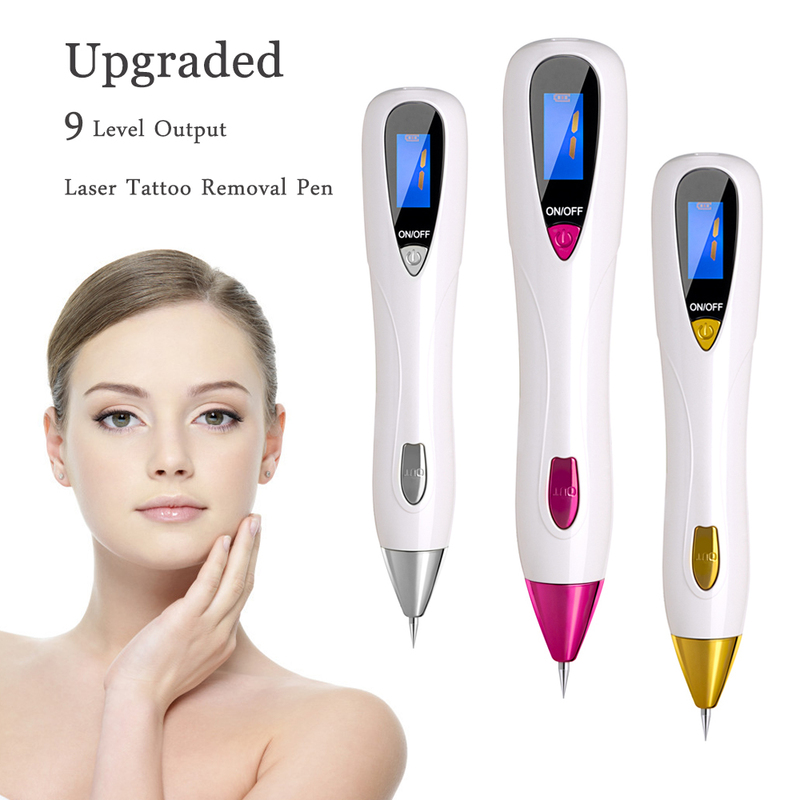 10pcs Fine needles and 3pcs Coarse needles to meet different treatment needs. 4. 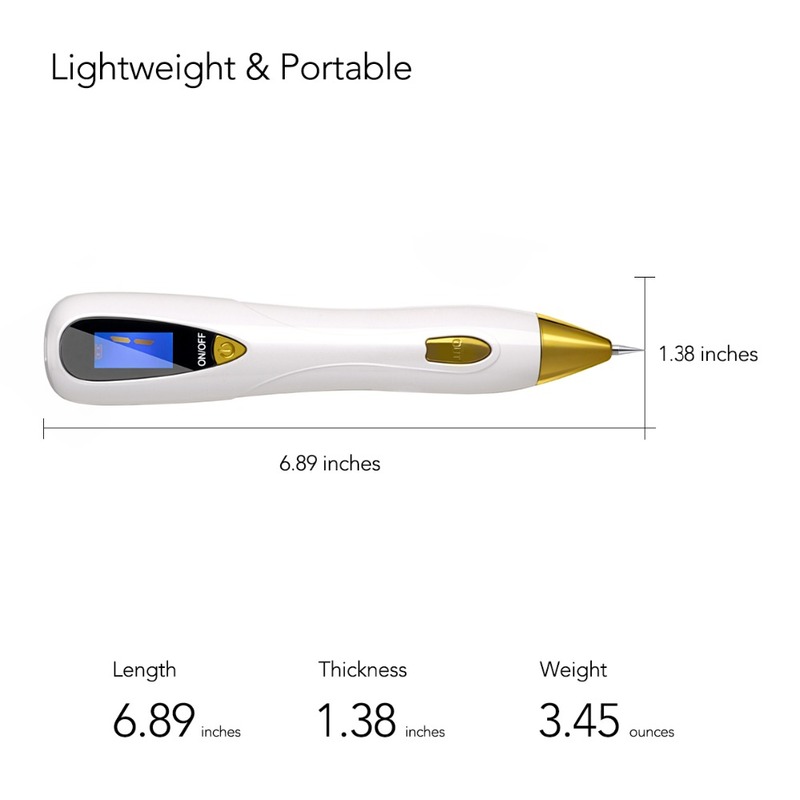 With led spotlight, There is a lighting spotlight on the needle end, can even be used in the weak light environment at night, convenient and practical. 5. LCD screen design, the battery powerand intensity gear are clear at a glance. 6. 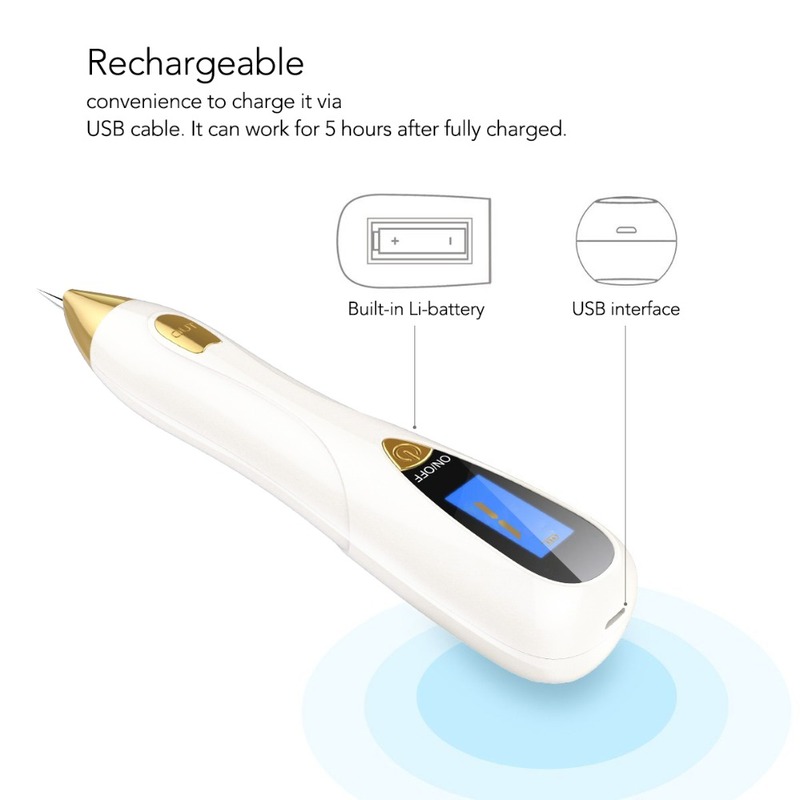 Rechargeable design, it can be used continuously for more than 5 hours after full charge. 7. 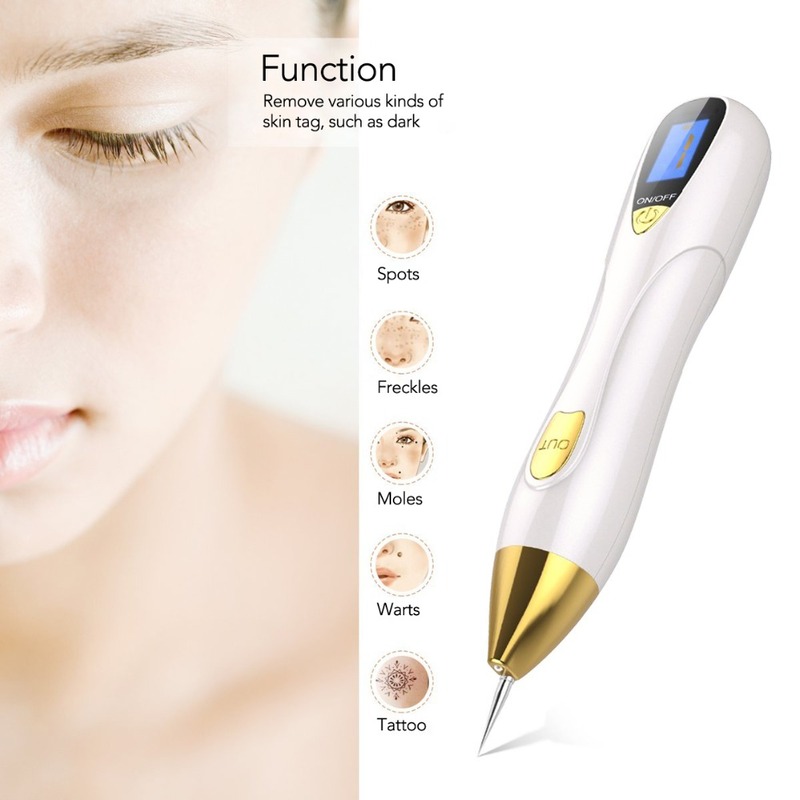 This Spot Removal Pen can be used for spots, freckles, fat granule, nevus, moles, wart, tattoo, granulation etc. 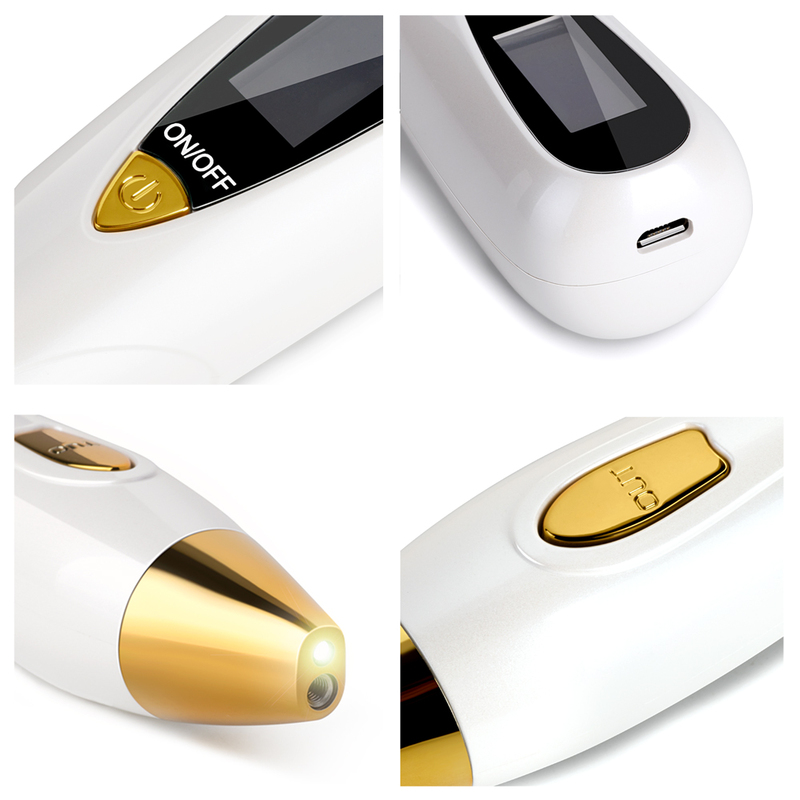 Similar as carbon dioxide (CO²) laser beauty machine, it use new generation of plasma micro district discharge technology with low temperature and high frequency, it is efficient capacity conversion material and Microcomputer chip control. 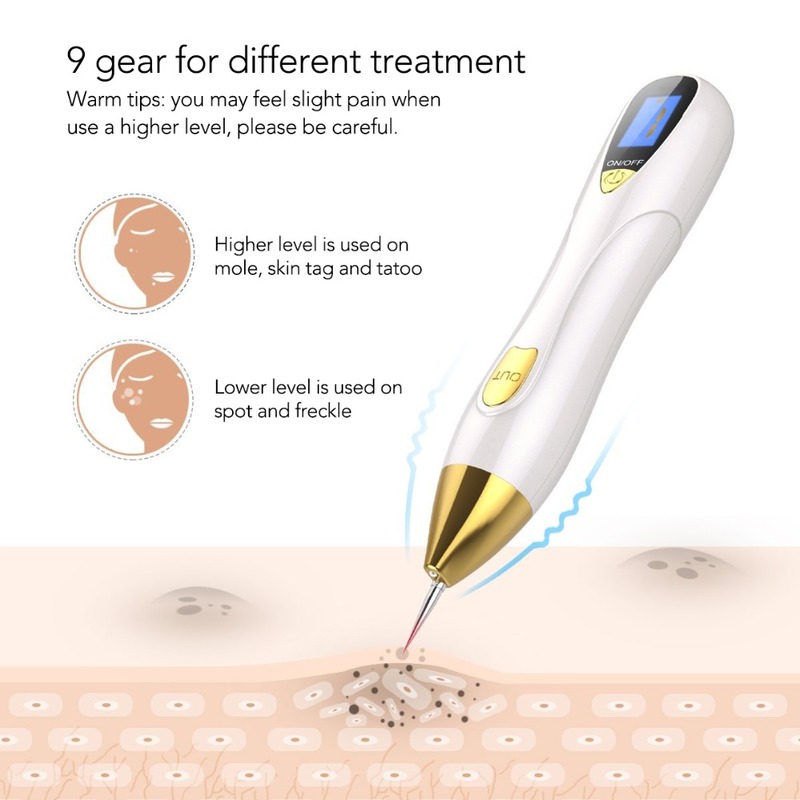 when the needle touch the freckle skin, it produce plasma with high temperature immedicately, when it touch the freckle, spot, it will produce a small flame, we called it carbide problem skin.The micro vascular will be solidified quicly without bleeding. Then it will formed carbon scabs,protect wound skin from infection. After about 1 week, scab will sheeding without scar. 2. Do not clean the affected area with strong alkaline washing or scrub. 3. Please promptly remove the needle after use, clean and disinfect, then keep dry. 4. During the recovery period (1-3 months), do not eat spicy food, keep a healthy lifestyle. 5. Do not use your hands to scratch when the scab itch. 6. Do not wash the device in water. 7. Keep away from children, persons who don't know operation and pets. 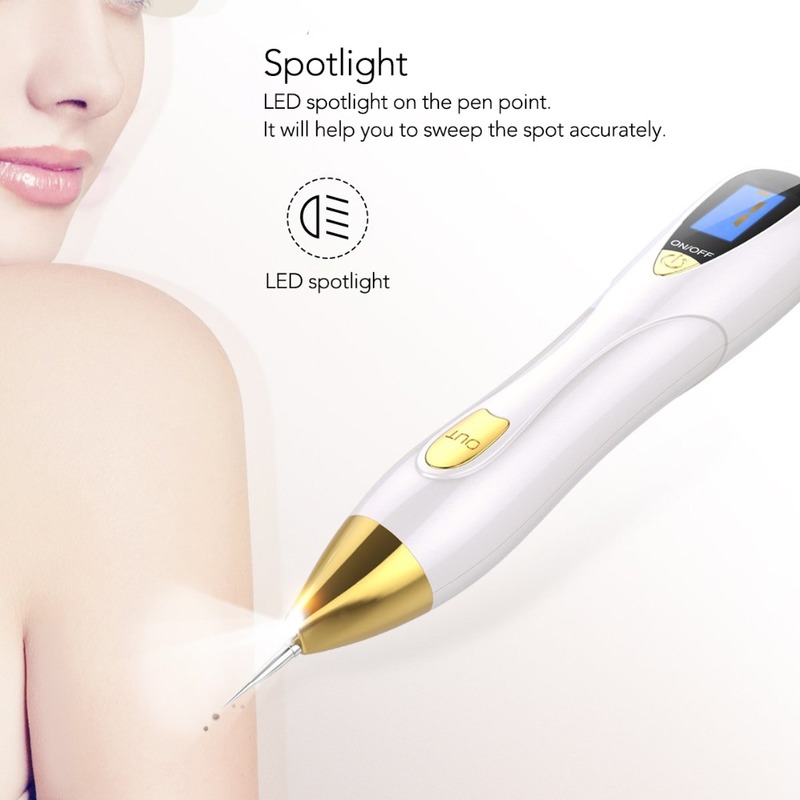 8.Please note that the needles can only touch the skin surface, No need to insert into the skin. 9.please use alcohol to swear on the skin first or use stabilizer (relieve effect) 20 minutes before using the device if you are sensitive to pain. 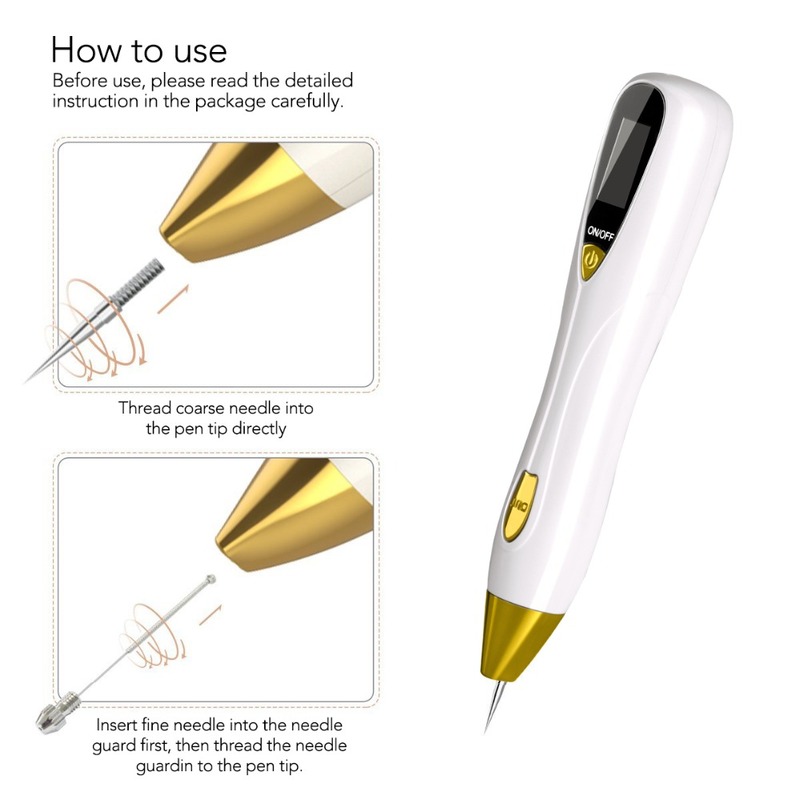 Directly insert the coarse needle into the head of the pen and tighten clockwise. The fine needle should be used with the pinhead cover. Rip the fine pinhead into the pinhead cover, and then insert the pinhead cover into the head of the pen, and then tighten clockwise. Sterilize the fine and coarse needles by boiling them in water or wipe them with alcohol pad for disinfection before use. 1. 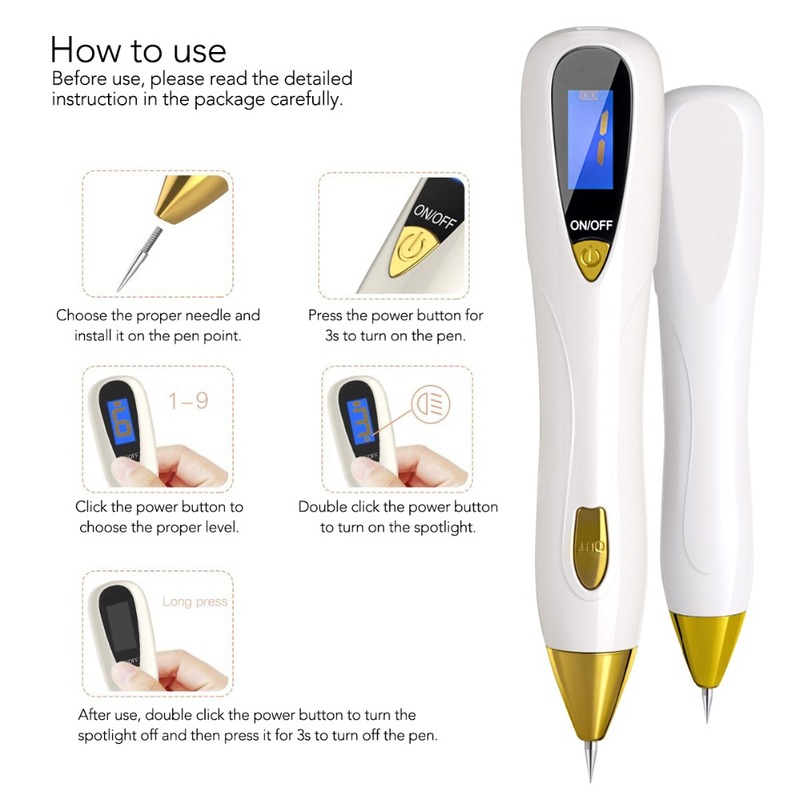 The needle is inserted into the head of the pen and rotated clockwise tightly. 2. Remove the needle counterclockwise when not in use. 1. Wipe the needle with alcohol to disinfect, use alcohol cotton to clean the skin of treatment sites. 1. For those who are sensitive to pain, use the alcohol cotton to clean the oil on the skin before operation. 2. 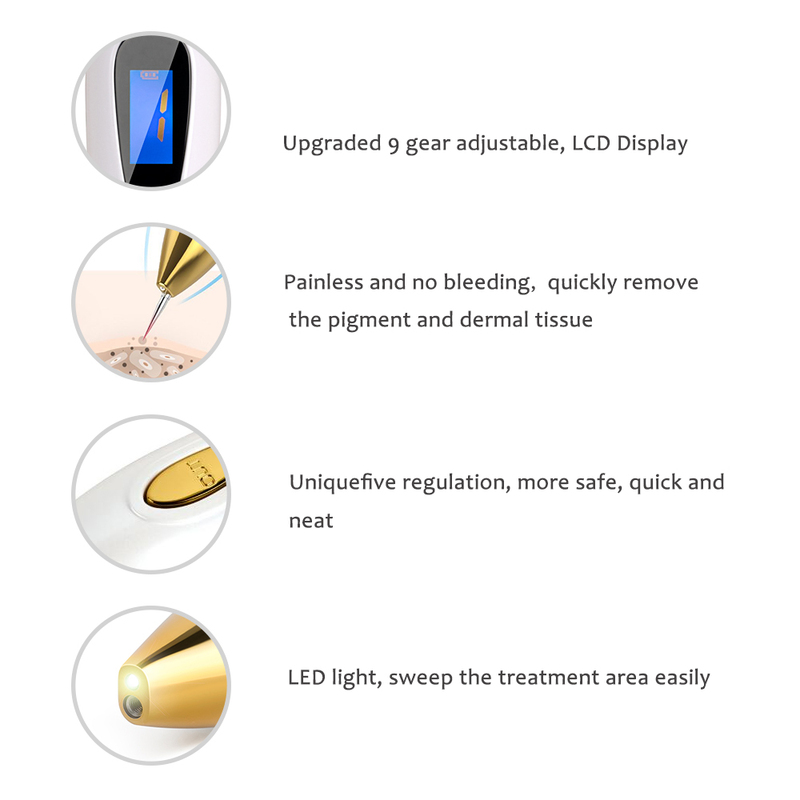 Apply some anesthesia cream on the skin to be treated, cover with plastic wrap, wipe away the anaesthetic cream after 15-30 minutes, then you can operate the device. 3. 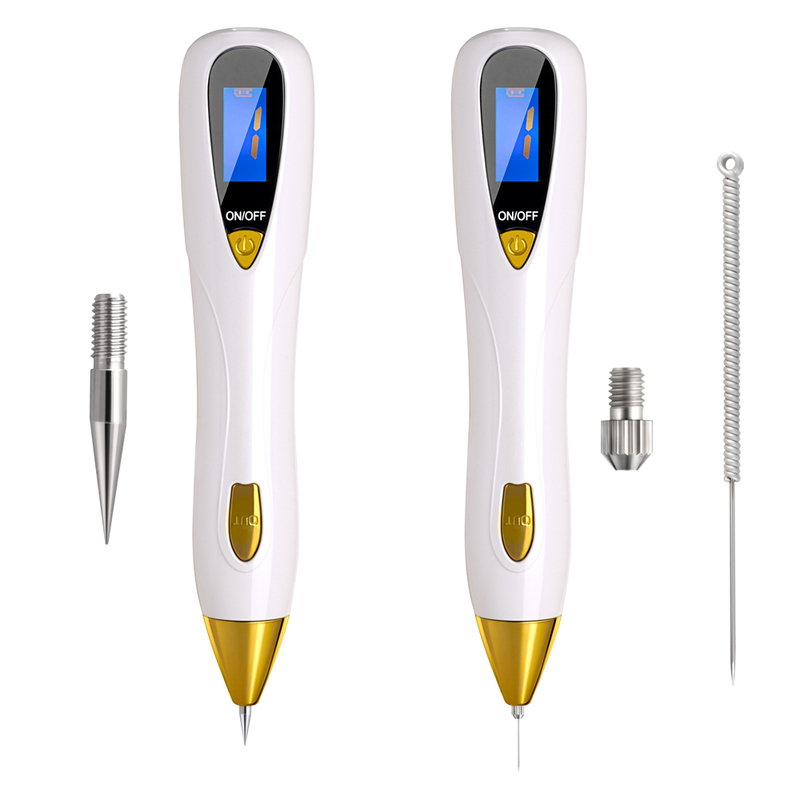 It can remove bad spots by carbonation, gently sweep back and forth on the spots. You can not stay in one place for too long, so as not to burn the dermis, resulting in scars. To ensure safety, it is recommended to remove dark spots by several times, it should not be too hasty.